FindersKeepers is our project for improving the range of the catalogue by drawing on the skills of home-based volunteers. If you would like to consider joining the project, we would be very glad to have you – to help you decide, here are the full instructions issued to volunteers. You can also view the FindersKeepers Instructions as a pdf. In recent posts, I have been boasting that more lists than ever before are available on the catalogue. Now that we have the Calmview browser, this includes ones that haven’t been imported into the database by FindersKeepers just yet, but are available as Word documents. And, as of today, where neither database nor wordprocessed versions are available (only 160 or so cases, but they all count), you should find a pdf version. In response to a request from one of our regular researchers, we have made the pdf pages text-searchable as well. That means the only species of catalogue list that cannot be viewed via the browser is our old friend/foe the “interim list”*. We would be pleased to hear people’s opinions on this, but here’s mine: on the face of it, we might be best advised not to put them online. For the uninitiated, an interim list is one that has not been verified, that relates to material that has never been satisfactorily listed. 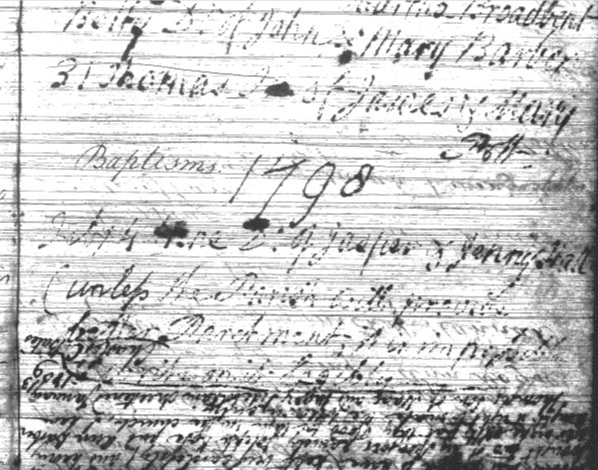 Some of them derive from surveys conducted before the material was deposited with us, and contain references to documents which we simply don’t have; some are summaries produced by record office staff long ago (or indeed by depositors) and give vague or inaccurate descriptions of the documents; and most fail to provide information that corresponds with the records that tell us which document is on which shelf. If we put them online, my worry is that we might raise expectations we cannot satisfy – whereas a researcher who picks up an interim list in the search room can at least be warned in person that there might be problems with producing the documents mentioned therein. So, my preference is to go through the interim lists in the next week or two and put a note on the catalogue entry for each collection indicating that an interim list exists, and inviting people either to view it in the search room or get in touch with us by email if that’s not possible. If you have a different perspective, please click “Leave a Reply” and let us know. *Other record offices may call them something else – but we’ve all got them! PS – None of the above does anything to address our backlog of unlisted collections. Unlisted material is noted on the catalogue by the appearance of /UL as a part of the reference. PPS – You might also have noticed that we have started using /NC in cases where there is no such collection. Usually this is because things have been re-catalogued. Have you ever wondered whether storing those precious old family photographs in a shoe box under the bed is really the right thing to do? How do archives store their old documents, photographs and books? And what can be done when they’ve been damaged? 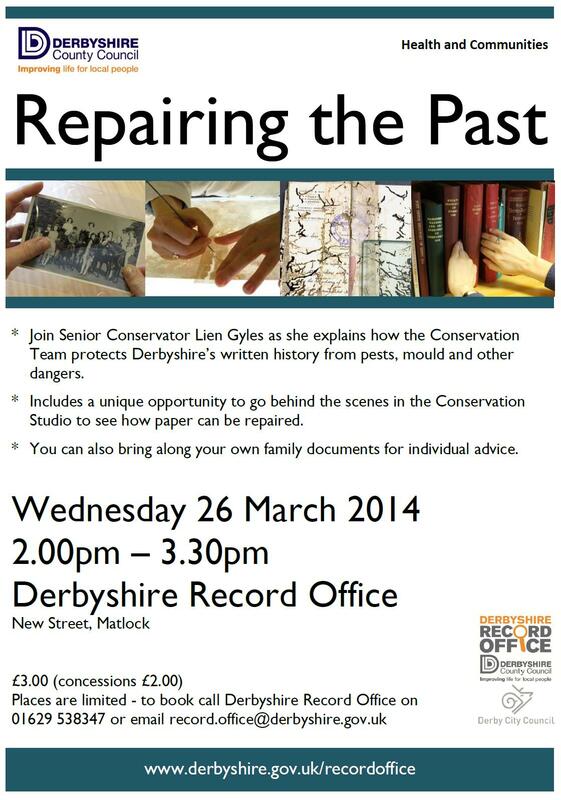 Come to Derbyshire Record Office on Wednesday 26 March to find out as the Conservation Team presents ‘Repairing the Past’. Senior Conservator Lien Gyles will explain all about the way the team protects Derbyshire’s written history from pests, mould and other dangers; then join us behind the scenes in the Conservation Studio to see how paper can be repaired. You can even bring along your own family documents for individual advice on safe-guarding them for future generations. Be aware: the Conservation Studio is only accessible via two flights of stairs. 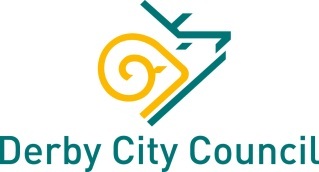 However, the talk itself will take place in an easily accessible room, which is also where we will give advice about any documents you might like to bring.